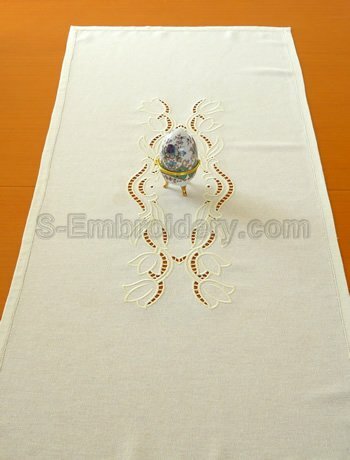 This set of 2 cutwork machine embroidery designs is available in 2 sizes. The smaller version is for 5x7 (130x180) hoops and the other is for larger hoops. Both versions are split into 3 parts. The largest parts of the large version have a size of 5.83 x 8.48 inches (148.2 x 215.4 mm). If you want the large size, please make sure your hoop is big enough. The largest part of the 5x7 version is 4.84 x 7.04 inches (123 x 178.8 mm). The size of the cutwork lace decoration, as featured on our web site, would be approximately 19 x 16 inches (488 x 162 mm) if you use the large version and 15.9 x 5.3 inches (405 x 135 mm) for the smaller (5x7) version. 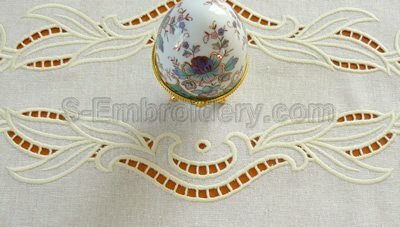 The set includes 4 machine embroidery files. 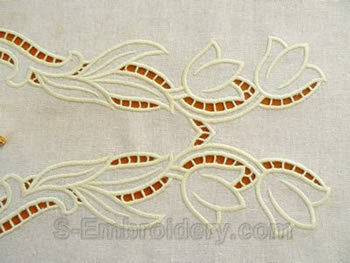 The first one contains cutwork lace placement markers and the other 3 are with the design parts. As usual it comes with instructions in PDF format.